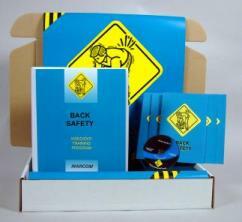 MARCOM’s “Back Safety” Safety Meeting Kit™ emphasizes the importance of overall back care, both at work and at home, including exercises and weight control. For many employees, back injuries are something that "happens to the other person... not to me." Yet four out of five people will experience some type of back problems during their lives. And many back injuries are caused by common activities experienced both on and off the job... such as lifting, climbing, reaching, etc. Materials in the kit include a video program, five motivational posters, and 30 employee booklets. The posters in the kit emphasize the importance of using proper lifting techniques. The videotape and employee booklet include information on how the back works, common types and causes of back injuries, effects of back injuries, injury prevention and safety practices, proper lifting techniques, basic back exercises, and more. The video program in the kit comes with a comprehensive leader's guide, reproducible scheduling & attendance form, employee quiz, training certificate and training log.